The next couple of pages show a few shots of me, harrowing the garden the old fashioned way. The tractor is a 1943 John Deere Model B, a hand-start "early styled" type. The harrow hitches to the drawbar with just a clevis. This old piece of equipment does a pretty good job of turning most light weeds and stubble into the ground. 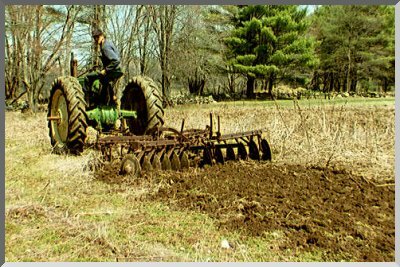 For heavy weeds and turf, though, it's better to plow first. Oh... You might be wondering why I call this implement a "Harrow", and not a "Disk". Well... I have the owner's manuals for these implements, and the John Deere Company calls them "Disk Harrows" right on the cover. Look at it this way: it is a TYPE of harrow that has DISKS instead of TINES. Take a look HERE for proof! Turn the page to see more about Harrowing.